From the Medical Education Department, Faculty of medicine, KingAbdul Aziz University. Address correspondence and reprints request to: Lana A. Al Shawwa, Assistant Professor, Medical Education Department, Faculty of medicine, KingAbdul Aziz University. Medical Education departments oversee the process of medicaleducation in medical schools and provide many educationalservices to support, evaluate and thus enhance the educationalrole of the medical school. Its roles revolve around research,teaching and providing educational support in areas of curriculumdevelopment and assessment. This paper provides a brief summaryon the emergence of different medical education centers/units/departments around the world from a historical perspective.Special attention will be given to the process followed inestablishing the Medical Education Department (MED) in KingAbdul Aziz University (KAU). This paper also explores the rolesthat are currently played within the department with a reflectionon documented roles of the medical education departmentsworldwide. Special emphasis will be given to explore the currentchallenges faced by KAU MED and proposed suggestions toimprove these challenges will also be addressed. Pharmacology Department, College of Pharmacy, Mosul, Iraq. Address correspondence and reprints request to: Isam H. Mahmood, Pharmacology Department, College of Pharmacy, Mosul, Iraq. Objective: To compare the effects of losartan and enalapril on themarkers of metabolic syndrome. Methods: One hundred and twenty six newly diagnosedhypertensive patients having other markers of metabolicsyndrome participated in this study. The study was performed inthe department of pharmacology, college of medicine at Ibn-SinaTeaching Hospital in Mosul city, Iraq, during the period betweenDecember 2007 and June 2009. The patients were divided into 2main groups: 1) Losartan group: consisted of 60 patients, and 2)enalapril group: Consisted of 66 patients. Waist circumference,weight, Body mass index, blood pressure, serum glucoseconcentration, triglyceride and HDL-cholestrol were measuredbefore and after administration of therapy. The effects of therapywere assessed by statistically comparing the results before andafter the drug administration. Results: Comparison of waist circumference, blood pressure,FSG, triglycerides of the patients before drug administration(baseline data), with those of the controls showed a significantelevation, while HDL-cholesterol showed a significant reduction.A significant reduction of waist circumference, BP, FSG and asignificant elevation of HDL-cholesterol were also noted aftertherapy with both losartan and enalapril. Conclusion: Both losartan and enalapril produced a significantreduction of markers of metabolic syndrome and may be regardedas effective drugs for treatment of hypertension in patients withmarkers of metabolic syndrome. 1Department of Obstetrics & Gynecology, General Hospital Mushin, Lagos State,Nigeria. 2Department of Microbiology, University Ilorin Teaching Hospital. 3Department of Obstetrics & Gynecology, University of Ilorin Teaching Hospital. 4Department Community Health, University of Ilorin. 5Department of Microbiology, University College Hospital, Ibadan. Address correspondence and reprints request to: Akinola B. Ajayi, Department of Obstetrics & Gynecology, General Hospital Mushin, Lagos State,Nigeria. Objective: To determine the prevalence of asymptomaticbacteriuria, bacteriology and sensitivity pattern in Ilorin using thegold standard of urine culture. Methods: A prospective study was carried out from 1st Julyto 31st October 2007, at the University of Ilorin TeachingHospital (UITH) on 125 consenting asymptomatic pregnantwomen. A structured proforma was used to collect informationfrom the women and a midstream urine specimen collected forbacteriological culture. Results: Of the 125 pregnant women, 50 had bacteriuria on urineculture giving a prevalence of 40%. The mean age of the womenwas 28.5 years with a standard deviation of 4.95. The age rangedbetween 14 and 40 years. Staphylococcus aureus was the commonestpathogen isolated (72%), followed by Proteus spp (14%). Most ofthe organisms showed good sensitivity to Nitrofurantoin andgentamicin. Conclusion: The prevalence of asymptomatic bacteriuria in Ilorinis high and routine urine culture is advocated for all pregnantwomen at booking. 1Department of Child Health, Sultan Qaboos University Hospital, Muscat, Al-Khod, Sultanate of Oman. 2Department of Pharmacology & Clinical Pharmacy, College of Medicine & Health Sciences, Sultan Qaboos University Hospital, Muscat, Al-Khod, Sultanate of Oman; Gulf Health Research, Muscat, Oman. 3Respiratory Therapist, Department of Medicine, Sultan Qaboos University Hospital, Al-Khod, Sultanate of Oman. Address correspondence and reprints request to: Reem Abdwani, Department of Child Health, Sultan Qaboos University Hospital, Muscat, Al-Khod, Sultanate of Oman. Objectives: The aim of this study was to investigate the frequencyof pulmonary function abnormalities in clinically asymptomaticchildren with Systemic Lupus Erythematosus and to determinethe relationship of these abnormalities to clinical, laboratory, andimmunological parameters as well as to disease activity. Methods: Forty-two children with childhood onset SystemicLupus Erythematosus were included in this study. Demographic,clinical, laboratory and immunological parameters, as well asdisease activity were assessed. Pulmonary function tests (PFT)were performed routinely to screen for subclinical lung disease. Results: Out of the 42 children, 19% (n=8) had clinical evidence ofpulmonary involvement. The patients with no clinical evidence ofpulmonary involvement (n=34) represent the study cohort. Fromour cohort of patients with no clinical evidence of pulmonaryinvolvement 79% (n=27) had PFT abnormality; including 62%(n=21) had reduced FVC, 71% (n=24) had reduced FEV1, and67% (n=12) had reduced DLCO. Similarly, 56% (n=15) hada restrictive PFT pattern, and 2.6% (n=2) had an obstructivePFT pattern, while 33% (n=7) had an isolated impairment ofdiffusion capacity. Due to small sample size; it was not possibleto find a statistically significant difference between the cohort ofasymptomatic SLE patients with abnormal PFT findings (n=27)and those with normal PFT findings (n=7) in terms of clinical,laboratory, immunological or disease activity index score. Conclusion: Subclinical lung disease, as demonstrated byabnormal PFT in patients with normal radiographs, may becommon but should be interpreted with caution as an early signof lung disease. Although PFT studies do not correlate well withpulmonary symptoms in patients with childhood onset SLE,they nevertheless provide objective quantification of the type andseverity of the functional lesions. 1Department of Gynecology and Obstetrics, School of Medicine, KashanUniversity of Medical Sciences, Kashan, Iran. 2Department of Biochemistry and Nutrition, School of Medicine, KashanUniversity of Medical Sciences, Iran. 4Department of Physiology and Pharmacology, School of Medicine, QomUniversity of Medical Sciences, Iran. Address correspondence and reprints request to: Shadi Sarahroodi, Department of Physiology and Pharmacology, School of Medicine, QomUniversity of Medical Sciences, Iran. Objectives: Zinc and Iron are essential micronutrients in fetusgrowth and development. The aim of this study was to assess therelationship of maternal serum Zinc, Hemoglobin and Ferritinlevels with their newborns weight, height and head circumference. Methods: This cross sectional-analytical study carried out amongpregnant women referred to Naghavi Polyclinic, Kashan, Iranfrom November 2009 to October 2010. One hundred and twentyninepregnant women in the third trimester were selected andanthropometric factors of their newborns (weight, height and headcircumference) and their relation to serum Zn, Hemoglobin andFerritin concentrations were assessed. Results: Serum Hemoglobin deficiency (<11g/dl), serum Ferritindeficiency (<12 µg/L) and serum Zn deficiency (<66 µg/dl) werepresent in 11 (8.5%), 9 (7%) and 9 (7%) women, respectively.The proportion of newborns with birth weight of 2500-2999 gwas greater among mothers with lower Hemoglobin (<11 g/dl)compared to mothers with normal Hemoglobin (≥11 g/dl; p=0.04).Multiple regression analysis showed that among biochemicalcharacteristics of pregnant women, serum Hemoglobin levels werepositively correlated with low birth weight (β=0.26; p=0.04). Butserum Zn and Ferritin levels were not significantly associated withweight, height and head circumference. Conclusion: Low maternal serum hemoglobin levels are associatedwith low birth weight and does not have any association withbirth height or head circumference; but there was no significantassociation between maternal serum zinc and Ferritin levels withweight, height and head circumference. 1Department of Hematology, Faculty of Medicine and Health Sciences, Sana’aUniversity, Sana’a, Yemen. Address correspondence and reprints request to: HAfiz A. Al-Nood, Department of Hematology, Faculty of Medicine and Health Sciences, Sana’aUniversity, Sana’a, Yemen. Objectives: To determine the prevalence of Glucose-6-phosphatedehydrogenase (G-6-PD) deficiency among Yemeni people fromdifferent regions of the country living in the capital city, Sana’a,giving an indication of its overall prevalence in Yemen. Methods: A cross-sectional study was conducted among Yemenimale blood donors attending the Department of Blood Bank atthe National Centre of the Public Health Laboratories in thecapital city, Sana’a, Yemen. Fluorescent spot method was used forscreening, spectrophotometeric estimation of G-6-PD activityand separation by electrophoresis was done to determine the G-6-PD phenotype. Results: Of the total 508 male blood donors recruited into thestudy, 36 were G-6-PD deficient, giving a likely G-6-PD deficiencyprevalence of 7.1%. None of these deficient donors had history ofanemia or jaundice. Thirty-five of these deficient cases (97.2%)showed severe G-6-PD deficiency class II (<10% of normalactivity), and their phenotyping presumptively revealed a G-6-PDMediterraneanvariant. Conclusion: The results showed a significant presence of G-6-PD deficiency with predominance of a severe G-6-PD deficiencytype in these blood donors in Sana’a City, which could representan important health problem through occurrence of hemolyticanemia under oxidative stress. A larger sample size is needed todetermine the overall prevalence of G-6-PD deficiency, and shouldbe extended to include DNA analysis to identify its variants in Yemen. 1Golestan Cardiovascular Research Center-School of Medicine - GolestanUniversity of Medical Sciences .Gorgan, Iran. Address correspondence and reprints request to: Gholamreza Veghari, Golestan Cardiovascular Research Center-School of Medicine - GolestanUniversity of Medical Sciences .Gorgan, Iran. Objectives: The main aim of this study is to determine the centralobesity trends during the period from 2006 to 2010 among 15-65years old people in Northern Iran. Methods: This was a population-based cross-sectional studyconducted on 6466 subjects who had been chosen by a multistage cluster random sampling within five steps. The subjects wererandomly chosen from 325 clusters and each cluster included 20cases. Central obesity was defined as waist circumference ≥102 cmand ≥88 cm in men and women, respectively. Results: Compared to 2010, the mean waist circumference in2006 changed from 87.2 cm to 88.1 cm in men (p=0.237), andfrom 90.3 cm to 88.6 cm in women (p=0.045). The comparisonbetween 2006 and 2010 revealed that the prevalence of centralobesity slightly decreased, 6.8% and 2.4% in urban women andmen, respectively. Generally, the mean of waist circumferencesignificantly decreased in urban women (by 0.069 cm in each year;p=0.020); however, the decrease of waist circumference in urbanmen was not significant (0.006 cm decrease each year; p=0.915). Conclusion: The prevalence of central obesity declined amongboth males and females in the urban area; however, there wasan attenuated increasing trend in the rural area. The disparity oftrends between the two regions should be considered for furtherstudy. 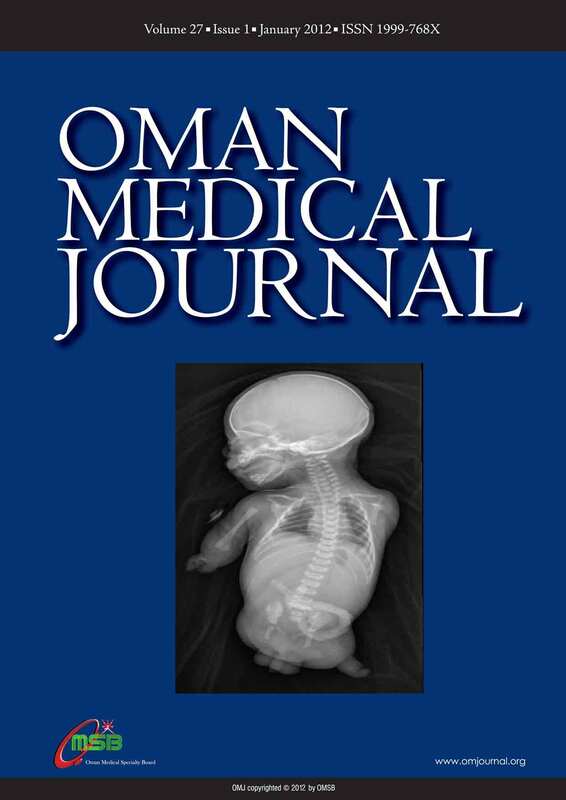 1Department of Obstetrics and Gynecology, Sultan Qaboos University Hospital,Muscat, Sultanate of Oman. 2Department of Child Health, Sultan Qaboos University Hospital, Muscat,Sultanate of Oman. Address correspondence and reprints request to: Nihal Al Riyami, Department of Obstetrics and Gynecology, Sultan Qaboos University Hospital,Muscat, Sultanate of Oman. Congenital limb defects are rare fetal anomalies with a birth prevalence of 0.55 per 1,000. Amelia is an extremely rare birth defect marked by the complete absence of one or more limbs. We report a case of fetal amelia, ultrasound findings, manifestations and the fetal outcome. 1Professor of Pathology, Oman Medical College, Sultanate of Oman. 2Department of Pathology, PSG Institute of Medical Sciences & Research,Coimbatore, India. 3Department of Gastroenterology, PSG Institute of Medical Sciences & Research,Coimbatore, India. Address correspondence and reprints request to: Prassana N. Kumar, Professor of Pathology, Oman Medical College, Sultanate of Oman. Light-chain deposition disease (LCDD) is characterized by tissuedeposition of the immunoglobulin light chains in multiple organs.These deposits appear similar to amyloid on routine sections, butdiffer in their staining properties and ultrastructural appearance.The deposits of LCCD are non -Congophilic and do not exhibit afibrillar ultrastructure; while, the proteinaceous substance seen inprimary amyloidosis is Congo red positive and fibrillar. One of themost common organs to be involved in LCDD is the kidney. Earlierreports on cases of LCDD have mostly shown simultaneous liverand renal involvement, there are very few cases in the literaturedescribing LCDD of the liver without renal involvement. Thisreport describes a patient who presented with severe cholestaticjaundice and liver cell failure with normal renal function. From the Department of ENT, Sultan Qaboos University Hospital, Sultanate of Oman. Address correspondence and reprints request to: Wameedh AL-Bassam, Department of ENT, Sultan Qaboos University Hospital, Sultanate of Oman. This report presents a novel style of placing nasal stents. Patientsundergoing surgical procedures in the region of nasal vestibuleand nasal valves are at risk of developing vestibular stenosis andlifelong problems with the external and internal nasal valves;sequels of the repair. The objective of the report is to demonstratea simple and successful method of an inverted V- Stent placementto prevent potential complication of vestibular stenosis and nasalvalve compromise later in life. Following a fall on a sharp edge ofa metallic bed, a sixteen month old child with a deep laceratednasal wound extending from the collumellar base toward thetip of the nose underwent surgical exploration and repair of thenasal vestibule and nasal cavity. A soft silicone stent fashioned asinverted V was placed bilaterally. The child made a remarkablerecovery with no evidence of vestibular stenosis or nasal valveabnormalities. In patients with nasal trauma involving the nasalvestibule and internal and external nasal valves stent placementavoids sequels, adhesions, contractures, synechia vestibularstenosis and fibrosis involving these anatomical structures.The advantages of the described V- stents over the traditionalreadymade ridged nasal stents, tubing’s and composite aural graftsare: a) technical simplicity of use, b) safety, c) less morbidity, d)more comfortable, and e) economical. To our knowledge, this isthe first report of such a stent for prevention of vestibular stenosisand preserving nasal valves. From Buraimi Hospital, Buraimi, Sultanate of Oman. Address correspondence and reprints request to: Khalifa Ali Al Jabri, Buraimi Hospital, Buraimi, Sulatnate of Oman. Meckel's diverticulum is the most common congenital anomaly of the small intestine. Common complications related to Meckel's diverticulum include hemorrhage, intestinal obstruction and inflammation. Small bowel obstruction due to mesodiverticular band of Meckel's diverticulum is a rare complication. Herein, we report the diagnosis and management of a small bowel obstruction occurring due to the mesodiverticular band of a Meckel's diverticulum. 1Intern doctor, Ministry of Health, Sulatnate of Oman. Address correspondence and reprints request to: Dr. Arif Jahan, Consultant, Obestetrics and Gynecology Department, Sohar Hospital, Sohar, Sultanate of Oman. We report the first case of a giant serous cystadenoma approximately 7.5kg in weight in a 28-year old primigravida at 8 weeks of gestation which was successfully excised laparoscopically. Postoperatively, she had a quick recovery and she was discharged on post op day 3 with an intact pregnancy and no complications. This is the largest ovarian cyst in early pregnancy that has been ever reported from our hospital. We also believe this cyst to be the largest cyst in early pregnancy ever reported in the literature that has been managed by Laparoscopy. Keywords: Serous cyst adenoma, Pregnancy, largest. From Inonu University Faculty of Medicine Turgut Ozal Medical Center, Ankara,Turkey. Address correspondence and reprints request to: Ebru Cakir, Inonu University Faculty of Medicine Turgut Ozal Medical Center, Ankara,Turkey. Clear cell adenofibromas of borderline malignancy are extremely rare tumors of ovary. We report a case of ovarian borderline clear cell adenofibroma in a 53-year-old postmenopausal woman. The patient had abdominal hysterectomy and bilateral salpingo-oophorectomy because of left adnexeal mass. The tumor was well-demarcated, solid and multinodular mass, measuring 12X10.5X6 cm. Microscopically, the tumor consisted mainly of fibrous stroma and glands composed of cells with eosinophilic or clear cytoplasm. The epithelium focally showed moderate nuclear atypia and mitotic figures. The histopathologic diagnosis was borderline clear cell adenofibroma. The patient is alive and well without signs of recurrence 6 months after the operation. From the Department of Pulmonary Medicine and Radiotherapy, Institute of Postgraduate Medical Education and Research, Kolkata, West Bengal, India. Lymphoepithelioma-like carcinoma, a large cell carcinoma with pronounced lymphocyte infiltration, is a rare entity mostly seen in the nasopharynx. But primary pulmonary LELC in children & adolescents is extremely rare. Here we present a 13 year old girl with chief complaint of fever, cough, shortness of breath and heaviness in the left side of chest. She underwent left upper lobectomy. Histopathological examination of the biopsy specimen confirmed it to be a case of large cell carcinoma of lung, lymphoepithelioma type, invading pleura (stage pT3N0M0) with high serum titre of anti Epstein-Barr virus IgG antibody. Under Representation of Women in Surgery in Nigeria: By Choice or by Design? Evidence Based Surgery: How Difficult is the Implication in Routine Practice?